I want to travel from Berlin to Kopenhagen with the DB IC bus. It gives me an option of choosing my seat. However, I have difficulty with it. I want a window seat. With large leg room in front. Preferably the seat facing the front windshield in the top floor. How do I know if it is available from this diagram? If yes, kindly point me the seat number. Additionally, does anybody know if I can change the seat after booking my ticket? All the seats coloured in dark grey are still available. Clicking on one of them will turn the respective seat green, indicating that you have successfully chosen the seat. 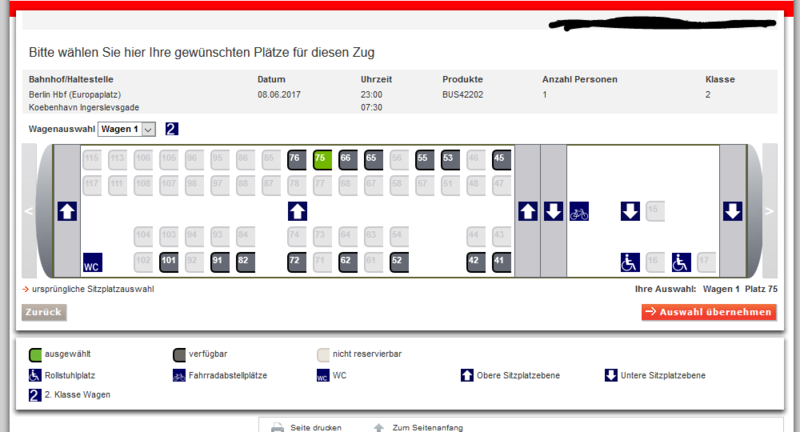 Then choose "Auswahl übernehmen" in the lower right corner to confirm your choice and continue with the booking process. As far as I can tell from the seat map, the seats on the left side (in the area with arrows pointing up) are on the upper level. The front of the bus is to the right which means you should choose seat 41 or 45, located in row one on the upper level. However, seats in the first row usually have a barrier in front of your legs, limiting your legroom. Sitting in any other seat, you would be able to slide your feet underneath the seat in front of you. On a side note, I would recommend booking on Deutsche Bahn's English website in order to see all relevant instructions in English. Not the answer you're looking for? Browse other questions tagged buses seating deutsche-bahn or ask your own question.